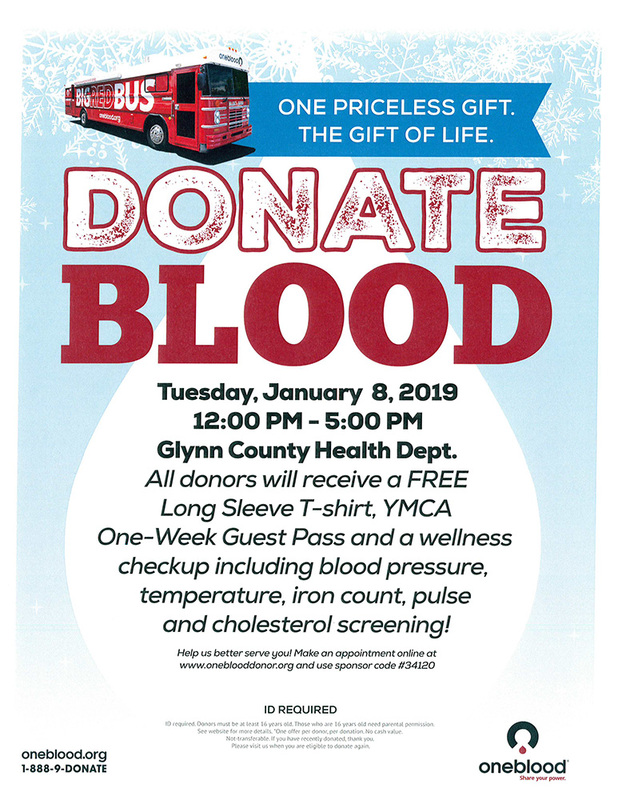 The Glynn County Health Department will hold a blood drive from 12 p.m. to 5 p.m. on Tuesday, January 8. Donating blood takes less than an hour and each blood donation has the potential to save up to three lives. Everyone who donates will receive a FREE long-sleeved t-shirt and one-week YMCA guest pass. In addition, all donors will receive a wellness check including blood pressure, temperature, iron count, pulse, and cholesterol screening. If you want to save time and make an appointment in advance, please call 912-279-3351. 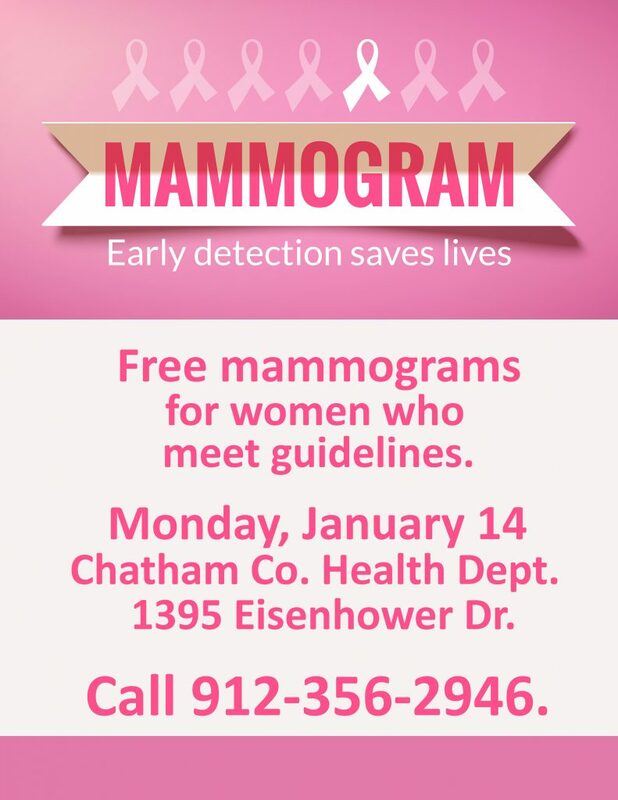 The Chatham County Health Department’s Breast and Cervical Cancer Program (BCCP) is partnering with the St. Joseph’s/Candler Mobile Mammography Program to offer free mammograms from 9 a.m. to 3 p.m. on Monday, January 14, at the Chatham County Health Department located at 1395 Eisenhower Drive. Women who meet certain annual income guidelines and are 40-64 years of age without insurance will be eligible to receive a screening mammogram at no cost. Appointments are preferred but walk-ins will be accepted. To make an appointment, please call 356-2946. Although we’re heading into spring, the flu is still circulating widely in Georgia. Getting vaccinated is the best protection against the flu and it’s not too late to get a flu shot. Health departments in Bryan, Camden, Chatham, Effingham, Glynn, Liberty, Long, and McIntosh counties still have flu vaccine available. If you get sick with flu-like illness, stay home for at least 24 hours after the fever is gone except to get medical care or for other necessities. The fever should be gone without the use of a fever-reducing medicine. Try to cough or sneeze into the corner of your elbow and not your hand or cover your nose and mouth with a tissue when you cough or sneeze. Throw the tissue in the trash after you use it. Wash your hands with soap and water. If soap and water are not available, use an alcohol-based hand rub. Avoid touching your eyes, nose, and mouth. Germs spread this way. A raccoon in Clairborn Retreat on Skidaway Island has tested positive for rabies. A family dog was found interacting with the raccoon in the family’s back yard. The dog is up to date on his rabies vaccination and will receive a booster vaccine. Avoid contact with animals you don’t know. Make sure your pets receive the proper immunizations. Dogs and cats should get rabies vaccines after 12 weeks of age, followed by a booster shot within one year and vaccination every 1-3 years depending on veterinary recommendation and vaccine used. Do not handle, feed, or unintentionally attract wild animals with open garbage cans or by leaving pet food out at night. Never adopt wild animals or bring them into your home. Do not try to nurse sick animals to health. Call animal control or a properly licensed animal rescue agency for assistance. Teach children to never handle unfamiliar animals, wild or domestic, even if they appear friendly. “Love your own, leave other animals alone” is a good principle for children to learn. Symptoms of rabies in animals include a change in behavior, biting, aggression, showing no fear of natural enemies (such as humans), foaming at the mouth, and paralysis. If an animal ever bites you, seek medical care immediately and contact Chatham County Animal Services at 912-652-6575 and the Chatham County Environmental Health office at 912-356-2160. Debbie Hagins, M.D., Jonathan Gibson, and Ilya Snyder-Shvahbeyn. Not pictured, Cristina Gibson. The GMS Health Care Innovation Award was given to Debbie Hagins, M.D., medical director and principal investigator for the Coastal Health District CARE Centers which provide comprehensive outpatient primary care (including nutritional services and oral health) and case management to persons with HIV/AIDS. The Coastal Health District Ryan White HIV program serves an eight-county geographic region and has the highest HIV incidence outside of the metro Atlanta area. Twelve years ago, Dr. Hagins helped spearhead the effort to bring HIV clinical trials to the Coastal Health District. The trials provide medication for individuals who otherwise may have never had access to research and that research will help determine what drugs will work best in treating HIV. Since 2006, she has served as Principal Investigator for 46 trials related to HIV care with a special focus on enrolling and maintaining two groups that have been historically overlooked or excluded: minority and female patients. Dr. Hagins’ hard work in the area of clinical trials has garnered local, state, and national attention bringing to light the important efforts being put forward in public health regarding HIV medication research and treatment. Her exceptional performance in providing comprehensive primary care to HIV patients and as Principal Investigator for numerous clinical trials has resulted in her participation as a key note speaker at several national meetings and she recently shared her expertise for an article in MD Magazine. She has co-authored many publications, abstracts and posters (several on the international stage). Dr. Hagins is highly respected in her field and is an excellent representative for public health and a strong advocate for providing comprehensive health care to underserved populations, especially those living with HIV. She achieved and has maintained certification as an HIV Specialist from the American Academy of HIV Medicine and was named a Fellow of the Academy of Physicians of Clinical Research (FAPCR). The FAPCR designation is reserved for Academy of Physicians of Clinical Research members who have shown significant commitment to, and achievement in, clinical research. 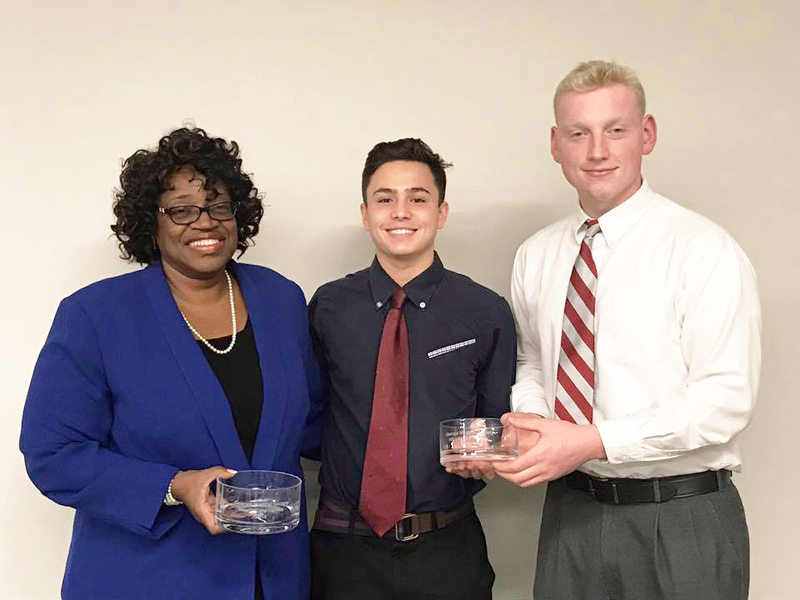 The GMS Community Outreach Award was given to Coastal Health District Chronic Disease Prevention Director, Cristina Gibson, her son Jonathan and his classmate, Ilya Snyder-Shvahbeyn. As a dedicated public health employee and head of the Chronic Disease Prevention program for our eight-county health district, Cristina is very attuned to the public health-related issues facing our citizens – particularly when it comes to health disparities – and has always looked for ways to help narrow the gap. A couple of years ago when Cristina’s son Jonathan and his classmate Ilya were trying to come up with a community outreach event as a class assignment, the three brainstormed and created Everybody Eats Fresh FREE Fridays (E2F3). E2F3 is a produce- and bread-only distribution program that provides access to healthy foods to residents in need, primarily on Savannah’s southside. The distribution takes place in a local church parking lot which gives it somewhat of a farmers market feel. To make this happen, Cristina, Jonathan, and Ilya partnered with America’s Second Harvest Food Bank to relieve the Food Bank of healthy foods that might otherwise be thrown out. Through its partnership with America’s Second Harvest Food Bank, E2F3 has been able to distribute an average of 12 tons of produce each year – tons of produce that would have otherwise been thrown away because of spoilage. During each event E2F3 is serving an average of 70 families and about 283 individuals (a majority of these being children and seniors). E2F3 serves those who are in the middle – they don’t quite qualify for government assistance but their income may not be enough to cover all necessities and often, food is an easier sacrifice than rent. E2F3 has been so successful that three additional sites are now running in the Savannah area. With the addition of the partner sites, E2F3 is able to provide even more Savannahians with healthy food that may give them a reprieve from worrying about where their next meals are coming from and allow them to redirect their dollars towards paying an electricity bill or paying down a medical bill. December 1 marks the 30th anniversary of World AIDS Day. Launched in 1988, the annual observance highlights worldwide efforts to combat HIV/AIDS. World AIDS Day is also an occasion to show support for those living with HIV and to remember those who have died from the infection. The Centers for Disease Control and Prevention estimate more than 1.1 million people in the United States are living with HIV today, and only 1 in 7 know it. Young people are the most likely to be unaware of their infection. Among people aged 13-24 with HIV, an estimated 51% don’t know it. Georgia leads the United States in HIV rates for adults and adolescents according to a report by the Center for Disease Control and Prevention. Coastal Health District HIV/AIDS program currently serves 1,398 clients living with HIV/AIDS throughout the eight-county district. 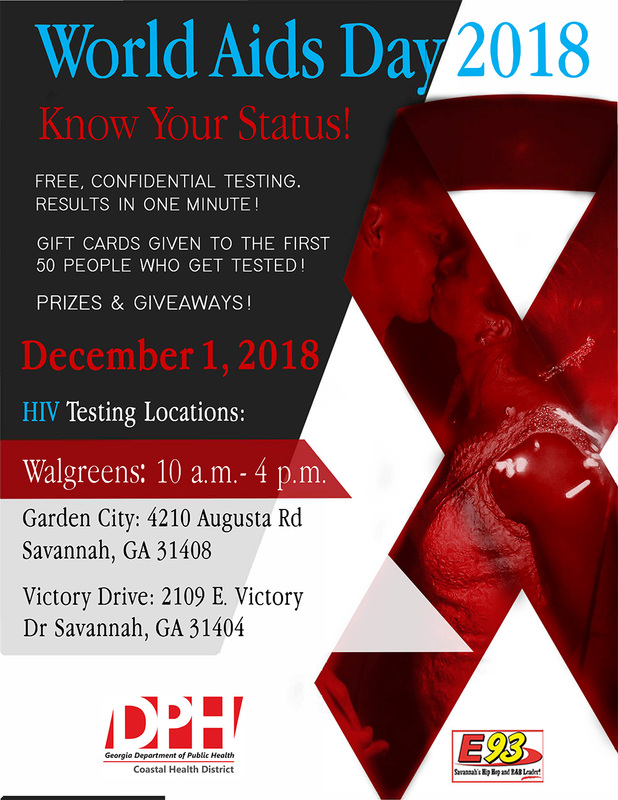 As a reminder, HIV testing is free at all health departments in Bryan, Camden, Chatham, Effingham, Glynn, Liberty, Long, and McIntosh counties and available Monday through Friday during regular health department hours of operation. Anyone with questions about testing can call Diane DeVore at (912) 644-5828 or e-mail Diane.Devore@dph.ga.gov. Learn more about HIV Prevention and how you can reduce risk. The Chatham County Health Department will hold a drive-through flu vaccination clinic from 9 a.m. to 3 p.m. on Thursday, November 15, at the parking lot across from Goodwill on Sallie Mood Drive in Savannah. Regular flu shots are $29 and high-dose flu shots – made especially to protect those 65 and older – are $55. Cash, checks, credit cards, most major insurances, Medicaid, and Medicare will be accepted. For more information or to download the consent form ahead of time, go to www.gachd.org/chathamflu. The Coastal Health District Chronic Disease Prevention Program will hold National Diabetes Prevention Program kickoff meeting from 5:30-6:30 p.m., on Monday, November 19, at the Coastal Health District administrative office located at 420 Mall Blvd. in Savannah. There are more than 79 million Americans who have prediabetes and many do not know it. In Georgia alone, more than one million people have diabetes and about 44,000 Georgians are diagnosed with diabetes every year. People with prediabetes have blood glucose (sugar) levels higher than normal. The levels are not yet high enough for a type 2 diabetes diagnosis; however, people with prediabetes are more likely to get type 2 diabetes than others. Diabetes can lead to serious health complications, including heart attack, stroke, blindness, kidney failure, or loss of toes, feet, or legs. Even though prediabetes puts you at high risk, there are ways you can lower your chance of getting type 2 diabetes. The National Diabetes Prevention Program is focused on helping prediabetics avoid type 2 diabetes by making modest lifestyle changes. The Program is free and is designed so that participants receive support not only through a Lifestyle Coach but also from each other by sharing ideas, celebrating successes, and working to overcome obstacles. 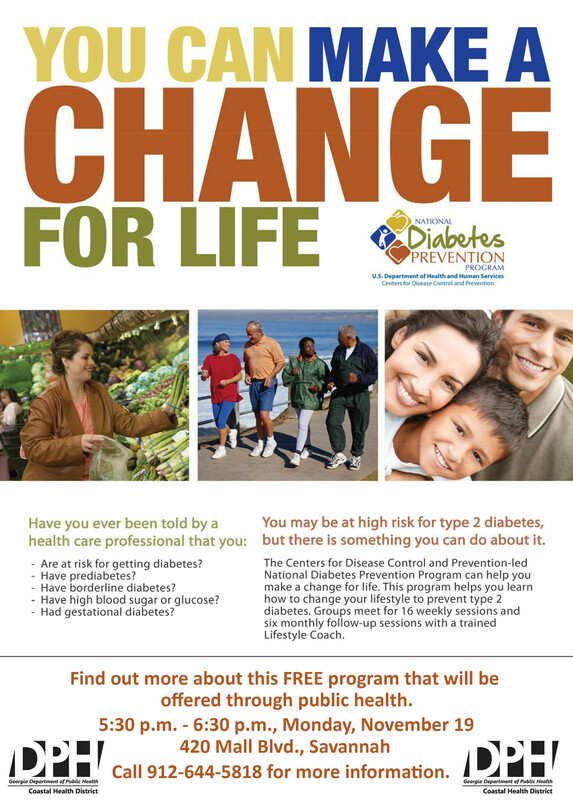 Participants at high risk for type 2 diabetes will learn how take steps to make positive, sustainable lifestyle changes. Anyone seeking additional information about the Diabetes Prevention Program can contact Coastal Health District Chronic Disease Prevention Director, Cristina Gibson at 912-644-5818 or email cristina.gibson@dph.ga.gov. The Chatham County Health Department in Savannah, Georgia, is soliciting competitive sealed bids from firms that are interested in and capable of providing Security Services; ITB # 2018-111. The Invitation to Bid is for three properties; 1395 Eisenhower Drive, Savannah, GA, 107 Fahm Street, Savannah, GA and 1602 Drayton Street, Savannah, GA. Packages can be obtained by contacting the Chatham County Health Department Administrator, Dr. Randy McCall, at 1395 Eisenhower Drive, Savannah Georgia (912)-356-2441. There will be a mandatory pre-bid meeting on October 26, 2018 at 2 p.m. at 1395 Eisenhower Drive, Savannah, GA. Interested parties are required to attend. Bids are due on November 2, 2018 at 2 p.m. and must be submitted to Randy McCall, Administrator. CHATHAM COUNTY HEALTH DEPARTMENT HAS THE AUTHORITY TO REJECT ALL BIDS AND WAIVE MINOR FORMALITIES.